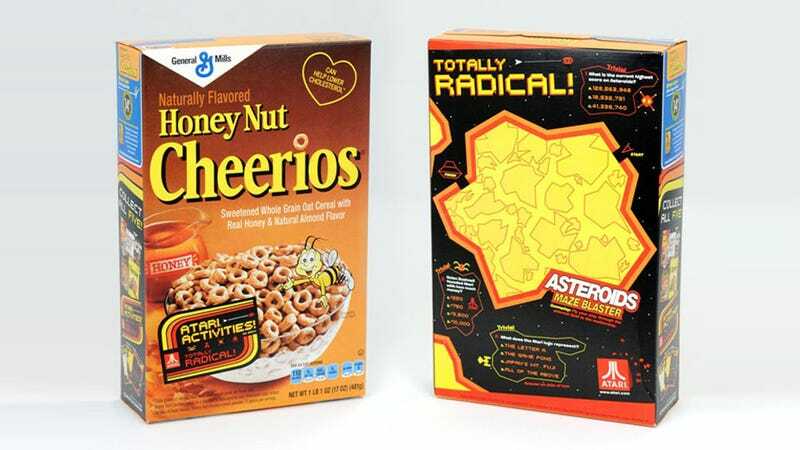 It might not be the video game-branded cereal Lisa Foiles craves, but the Atari-classic branded General Mills cereal boxes popping up at Target stores across the country might have you bringing the box back to the breakfast table again. Let’s Eat More Video Games, For Breakfast! Five different cereals, five different games. In celebration of the 40th anniversary of video game pioneer Atari, General Mills and Target have teamed up to deliver specially marked boxes of Cheerios, Cinnamon Toast Crunch, Honey Nut Cheerios, Cocoa Puffs, and Lucky Charms. On the front, delicious cereal. On the back, Asteroids, Centipede, and more come to life through the sort of fun activities you cared about back when the Atari 2600 was the bee's knees. I'm not much for cereal these days, but I might consider making an exception in this case. Besides, as a new parent I am legally obligated to buy Cheerios and stuff them between the couch cushions and about the floorboards of my car.